The DJI Assistant 2 software contains extra settings and utilities for all DJI equipment such as drones, gimbals and cameras. With the DJI Assistant 2 Mavic, you have options to upload flight data, black box information, calibrate your vision sensors and upgrade your firmware. There is also a DJI Assistant 2 Simulator for testing flight parameters and practice flying your Mavic Pro. The DJI Assistant 2 download and install only takes a few minutes and is available for Windows and Mac computers. This post contains all the essential information and more on the DJI Assistant 2 app for the Mavic quadcopter. Now, if you have a Phantom 4 or DJI Spark, the DJI Assistant 2 is the same version. Therefore the below Assistant 2 settings and utilities will be very similar. Now, the DJI Assistant software is for all DJI equipment. Their equipment all have a micro USB port. Then, with the DJI Assistant software installed on your computer, you connect your DJI device to your computer. 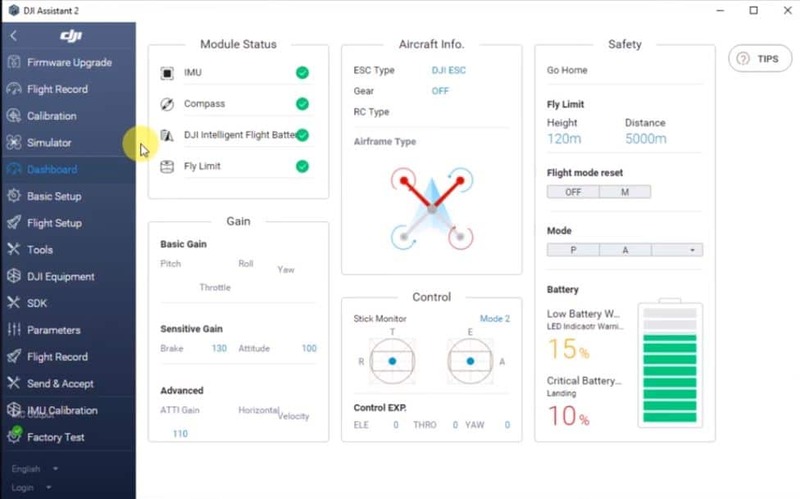 The DJI Assistant software will recognize the device whether it is the latest Mavic 2 or a DJI Goggle, Mavic Pro, Spark, Phantom, M600, Osmo, Zenmuse or Lightbridge flight controllers etc. For most DJI equipment, the DJI Assistant will only allow you to update the firmware. It is different for their quadcopters. 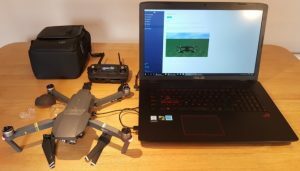 Now, with older versions of the DJI Assistant 2, it was very easy to modify your Mavic Pro quadcopter to make changes to flight parameters and other features. We will look at these extra settings and how you can still modify your Mavic Pro using DJI Assistant software. The latest version of the DJI Assistant 2 Mavic software contains the below components which we will look at in turn. The DJI Assistant 2 software is not a cellphone app. It is installed on computers and there are Windows and Mac versions. The DJI Assistant software is almost totally different than the DJI Go 4 app. The only similarities is that you can update the firmware using the DJI Assistant or the DJI Go 4 app. If you look at the above components and utilities, you can see that the DJI Assistant is very much aimed towards helping to backup, identify, troubleshoot and fix issues with the Mavic Pro. Information such as Data Upload and Black Box can be made available to DJI to identify issues where they can examine the flight history and component data to see how to fix the drone. The data can also be used to make improvements through firmware updates. DJI drones are really like flying computers with top cameras. When troubleshooting a computer and likewise with the Mavic Pro, doing a firmware update or restoring to the factory default will fix many issues. Updating firmware wouldn’t be the first step in troubleshooting a problem but many issues such as the Mavic Pro disconnecting from the Remote Control or DJI Go 4 app can be fixed by an upgrade. Calibration is also a vital step in trying to fix flight issues. The DJI Assistant 2 contains the vision sensor calibration utility which you are read more on below. Download the latest DJI Assistant 2 software here to your PC or MAC for the Mavic Pro. The latest Assistant 2 version at the time of writing is 2 v1.2.4. The DJI Assistant software for Mac and Windows computers is different so make sure you download the correct software. The Assistant 2 download is approximately 217 mb for PC and has a .exe file extension. The MAC Assistant 2 version is approximately 229 mb is size and has a .pkg file extension. The Mavic Assistant 2 download file will be called something like “DJI+Assistant+2+1.2.3.exe” with the file name containing the software version. Download the latest Mavic 2 Pro DJI Assistant 2 software here to your PC or MAC for the Mavic Pro. The latest Assistant 2 version for the Mavic 2 Pro And Zoom at the time of writing is v2.0.6. The DJI Assistant software for Mac and Windows computers is different so make sure you download the correct software. 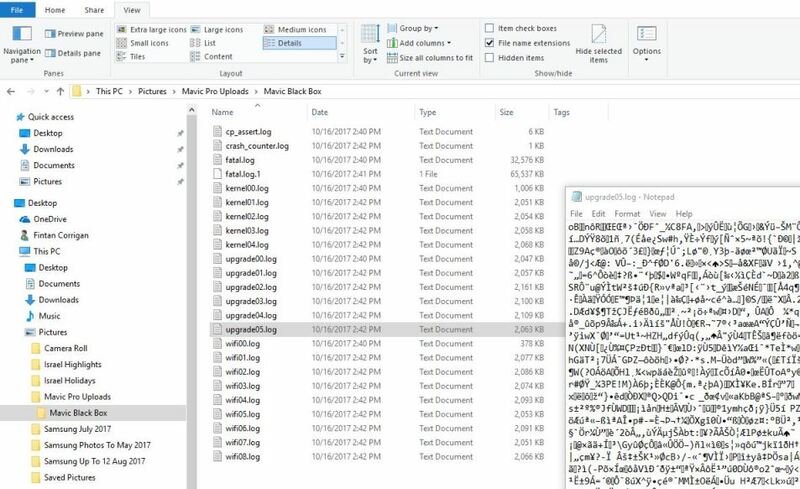 The Mavic 2 Assistant 2 download is approximately 187 mb for PC and has a .exe file extension. The MAC Assistant 2 version for Mavic Pro 2 and Zoom is approximately 345 mb is size and has a .pkg file extension. Below we look at each component of the DJI Assistant and how it can help you in understanding and helping fix your Mavic quadcopter. In this area of the DJI Assistant 2 Mavic Pro software, you can see your present firmware version and whether there is a new firmware update available. You can also read the release notes if there is a new firmware available. You may also see an older Mavic firmware version. 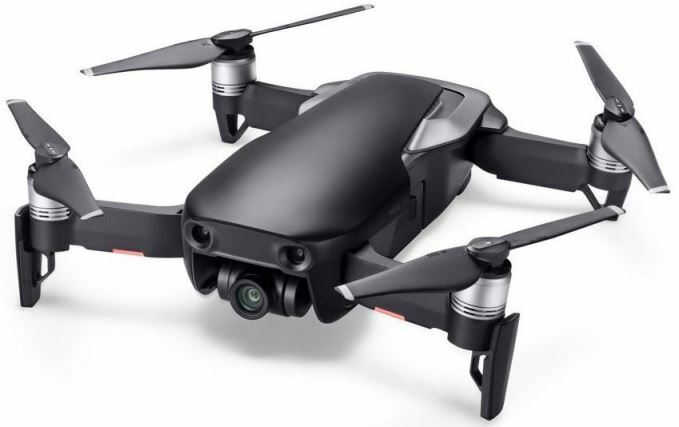 You may need to downgrade to an older version if you installed the latest firmware and it contained a bug which caused problems with your Mavic Pro quadcopter or remote controller. You would then downgrade your Mavic Pro firmware. Updating the firmware will fix many issues and add new features to the Mavic Pro. Here is the instructions on how to use the DJI Assistant 2 to update the firmware for the Mavic Pro quadcopter and remote controller. Both can be done at the same time. You can find more information on how to update the Mavic Pro firmware here. There is tips and instructions along with videos on how to update the Mavic Pro using both DJI Go 4 app and also the DJI Assistant. If you need parts or upgrades for you Mavic Pro, then visit this excellent Mavic Pro page here. The Data Upload section allows you to upload information from the Mavic Pro to your local computer. 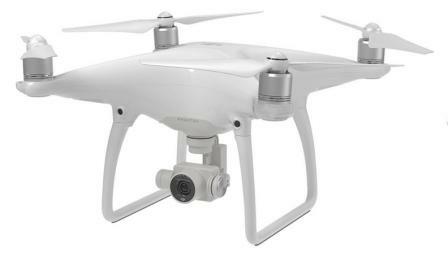 You can upload aerial videos, photos and flight log data. You can choose where you want to save the file to. The file been saved will have a .DAT file extension. The file name will look similar to “DJI_ASSISTANT_EXPORT_FILE_2017-10-16_14-15-30.DAT”. My last upload was over 1.06 GB in size as I uploaded all files. So this can take quite a few minutes to upload. When you first open the Mavic Pro Data Upload option, it states in the text pop up box that you will be uploading to the DJI Server. However, I actually only uploaded the data to my laptop. Now, you need to click on confirm before you can upload to your computer. Please read the information in the pop up box before confirming. Here is the full instructions on using the DJI Assistant data upload. All files are un-selected. You can select all or choose which files you want to upload. Click on Complete at the end. 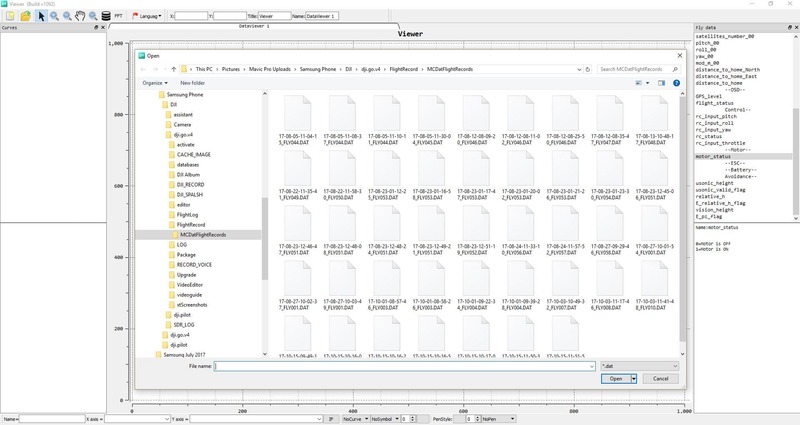 All the individual files are now saved as one compressed DAT file. So we basically have made a backup of the Mavic Pro quadcopter to our local computer. This brings you into an area where you can view the Flight Data records. This section is for checking and analyzing flight data on the Mavic Pro performance and also for diagnosis. The data is stored in the SD card in the Resource Manager. Click on Open Data Viewer and browse to the data on your SD Card. Now, if you cannot locate the flight records on your SD card, you can find the flight records on you cellphone. This is because the records are also stored by the DJI Go 4 app on your phone. Connect your cellphone to your computer. If you have an Android phone, then the cellphone shows up as a drive on your computer. It is very similar for iPhone’s also. Next, navigate through the folders and find the flight record data in the DJI → dji.go.v4 → FlightRecord → MCDatFlightRecords folder. The DJI Assistant 2 Mavic Flights Records have a .DAT file extension such as 17-08-05-11-10-11_FLY044.DAT. To learn more about the above drone components, read and watch videos on IMU, Gyroscope and Accelerometer technology in drones. This is where you can export the Mavic Pro black box flight log to your local PC. It is not just the quadcopter black box data. You can also upload the Remoter Controller black box data. This information would be vital if your Mavic Pro was flying weird or even crashed. The DJI Repair Center would analyse the black box data which contains flight control information. You can navigate to where you have saved the Black Box data and you will find log files. However these are unreadable without special software. You can upload these to the DJI Server for them to use to troubleshoot issues or bugs on the Mavic Pro. If you were having some weird issues with your Mavic Remote Controller, then DJI may ask you to upload the raw log data from the RC. The below video will show you how to use the DJI Assistant 2 to download and export the Mavic RC data. This is the area where you calibrate the vision sensors on your Mavic Pro. Knowing how to calibrate the Mavic Pro vision sensor is very important. If your receive a vision system error on your Mavic Pro, then calibration may fix the problem. Also, if you are flying your Mavic Pro and the vision system error occurs, you need to fly the quadcopter back to you straight away. Below we have instructions on the Mavic Pro vision sensor calibration process. You can also find more information on calibrating the vision sensors here along with notes and videos. There is also terrific information on the Mavic Pro Vision Positioning system. Open the DJI Assistant 2 software on your computer or laptop. The DJI Assistant 2 software will recognize that the Mavic Pro is connected. Watch the steps involved in calibrating the Mavic visions sensors. The green and red squares have to match so you may have to move the Mavic Pro forward towards the screen and back to you to get them to match. You calibrate the vision sensors by moving the Mavic so as to line up the corners of the blue square to coincide with the blue boxes. Next, follow the blue square around the screen which is the last stage. Once completion of the Mavic vision sensor calibration, the DJI Assistant 2 software will automatically calculate, apply and save the VPS calibration settings. This is a virtual 3D environment from flight data which is transmitted to your PC. This Assistant 2 is in fact called Simulator Lite. Before opening the Simulator Lite application, there are a couple of notes. Remove the propellers (extremely important). Check and reset the settings in the DJI Go / Vision App. No-Fly-Zone limit is not effective in the Simulator lite. Next switch on your Mavic Pro Remote control and you can fly the Mavic Pro in the Simulator. The Mavic will fly and behave according to the latitude, longitude and wind speed which you programmed in. When you click on the WiFi Settings in the DJI Assistant 2, you will be brought to the settings page. The DJI Assistant 2 software will pull the WiFi SSID and Password from your Mavic Pro as you can see in the below image. I have removed some characters from my password in the below image. 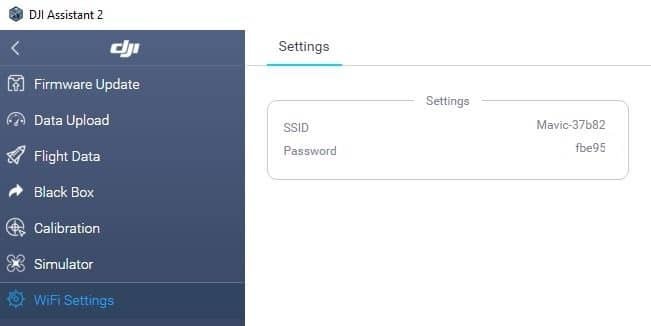 Now, for the DJI Assistant 2 to recognize your Mavic WiFi SSID and password, you first need to configure and add the Mavic WiFi in your laptop network settings. You computers WiFi will detect the Mavic WiFi so you should only need to put in your password. To find the SSID and password on your Mavic, check on one of the front arms. You can also find the SSID and password by removing the battery from your Mavic. There is nothing else to configure in the DJI Assistant 2 WiFi Setting. If you have many questions regarding your Mavic, then you can find many Mavic FAQ answered here. So the DJI Assistant software is not for one specific DJI hardware. When you connect your DJI equipment to your computer and start up the DJI Assistant 2 application, it will recognize the device. So to update the DJI Goggles for example, you would connect your goggles to your laptop via the mini-USB port. It is the same for DJI drones, gimbals, propulsion systems and flight controllers..
Now if you look at the latest release notes on the DJI Assistant 2, you can see all the fixes and new features for DJIs full range of products. I have mentioned just a few below and you can find more on the DJI Assistant 2 download page. A3 / N3 – Added an option which allows the motors to start one by one. So reading the release notes is extremely interesting. You definitely can see how each firmware release fixes issue, makes improvements and adds new features to the device. Now with the latest version v1.1.6 of the DJI Assistant, you are not able to see the extra setting to modify many of the Mavic flight settings and parameters. With DJI Assistant 2 version v1.1.2, you could make many changes such as the below and many more. If you have installed the v1.1.6 of the DJI Assistant 2, well you can’t have v1.1.2 installed at the same time. For example, there is no option to install the DJI Assistant to a different location in your hard drive. So you have to uninstall the newer version and install the older v1.1.2 version. Or, if you have a 2nd computer you could install v1.1.2 on it, then attach your Mavic. With v1.1.2, you still need to make a small configuration change in the main.js in the DJI Product → DJI Assistant 2 → App Files folder. The instructions are in the below video. You can find and download the older DJI Assistant version v1.1.2 here. Look below the video and you will see the links. The .exe file will be for Windows computers and the .pkg will be to install the DJI Assistant on Macs. In the below DJI Assistant 2 video, it shows you how to configure the Assistant 2 software to give you the extra Dev-tools settings and also how to modify your Mavic Pro. Note: Please be careful making modification to your Mavic Pro. If you are unsure on what you are changing, then do your research, post a question on the DJI forum or even write an email to DJI Support. You definitely don’t want to make a change that would make your Mavic Pro crash. No one wants that. If you are into programming, then if you want to make changes to the Mavic pro or create new applications then you should sign up and use the DJI SDK developer tools. Ok. Watch the below video and follow the instructions to modify your Mavic Pro.